The car gets additional accessories at a discounted price. It rivals the newly launched Tata Taigo NRG. The 2018 Maruti Ignis currently clocks a monthly average of 4,000 units which is not a bad number for most OEMs but for a company which dominates the A and B segments, the micro SUV’s sales performance can be best termed as lackluster. The unconventional design didn’t quite catch traditional Indian hatchback buyer’s fancy, not even with an appealing value-for-money quotient and peace of mind that is usually associated with Maruti Suzuki badge. So, in a bid to boost the sales, the company has been offering significant discounts on the Ignis. 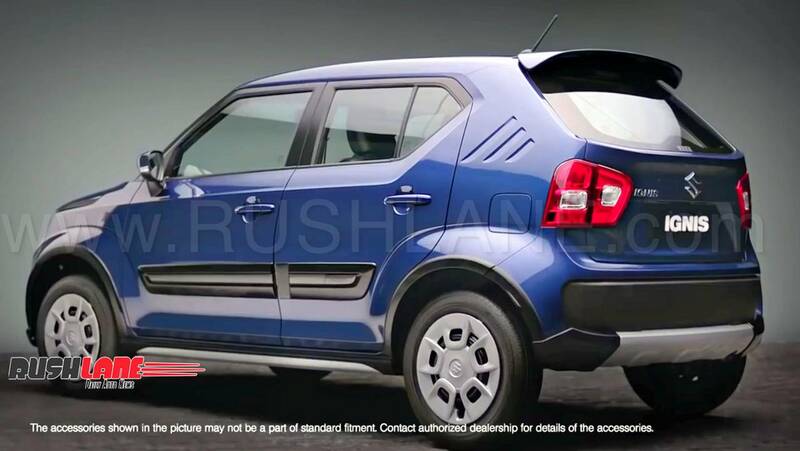 Maruti has also introduced a limited edition version of the micro crossover without much fanfare. The announcement comes in the form of a TVC and highlights the goodies the limited edition comes with. Like most limited edition models from Maruti, the Ignis LE limited edition is essentially an accessorized version of the standard car. In fact, the accessorization takes place at the dealership for a special price. The add-ons are worth about Rs 45,000 but under the guise of limited edition, the Nexa dealership will fit them on your car at Rs 30,000. The accessories include silver skirts, matching front and rear skid plates, Ignis branded side rub strips, rear roof-mounted spoiler, and premium seat covers. The limited edition kit can be fitted on any of the available four trim levels. The car in the TVC belongs to Delta trim and comes with standard dual airbags, ABS, remote keyfob, electrically adjustable wing mirrors and an audio system. The Maurti Ignis is available only with the 1.2-litre petrol engine which is good for 82 PS and 113 Nm of torque. Standard transmission is a 5-speed manual unit but buyers can also opt for an Automated Manual Transmission. The diesel engine option has been withdrawn from the market owing to poor sales performance. The Maruti Ignis competes with the new Tata Tiago NRG, which was launched earlier this week in India. The 2018 Maruti Ignis retails between Rs 4.66 lakhs to Rs 7.05 lakhs (ex-showroom, Delhi).